The best platform to introduce H.I.I.T. Sprint Training conveys numerous benefits for people of all ages, body types, and abilities. Users will benefit from short sprints on the HiTrainer FIT during small group training to elevate their intensity level. Corporate clients looking to save time will love the high intensity intervals, whereas seniors may find that moderate-intensity walking intervals will give them the best results. The HiTrainer FIT is different from other non-motorized treadmills because the belt offers no momentum, enabling a safe experience since the belt stops exactly when you do. It is possible to adjust the running surface from light resistance to 300 pounds for heavy-duty sled training. 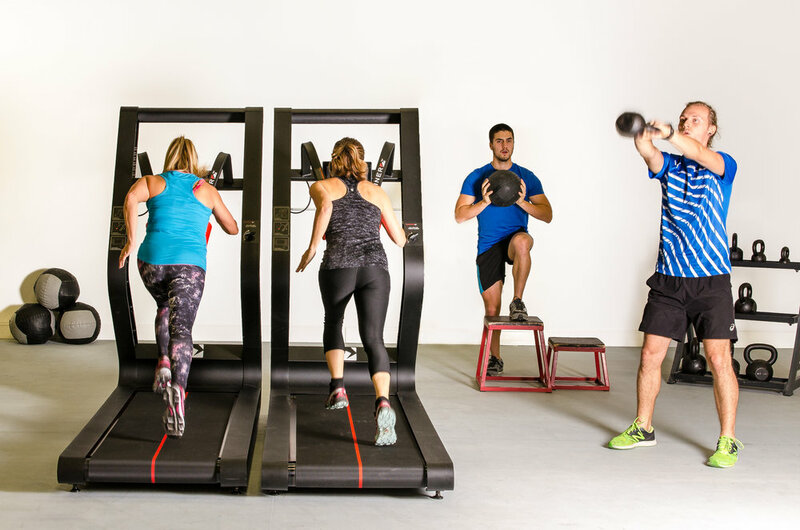 With very limited space, coaches and clients can use the HiTrainer FIT for cardio, strength, rehab, athletic training, circuit training, weight loss program and client evaluations. Other than being versatile for different type of trainings, the HiTrainer FIT will also optimize the space in comparison to the turf you would need to do sprint or sled work. The HiTrainer FIT puts the trainee at a 50-degree angle which significantly reduces the running impact on the lower back and joints, therefore it is appropriate for different clientele such as the overweight or those without an athletic background.